UCI Professor Alexei A. Maradudin: Outstanding Referee for the journals of the American Physical Society. UCI Professor Alexei A. Maradudin is among the 142 Outstanding Referees of the Physical Review and Physical Review Letters journals, as chosen by the journal editors for 2015. 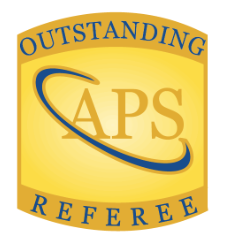 The Outstanding Referee program was instituted in 2008 to recognize scientists who have been exceptionally helpful in assessing manuscripts for publication in the APS journals. By means of the program, APS expresses its appreciation to all referees, whose efforts in peer review not only keep the standards of the journals at a high level, but in many cases also help authors to improve the quality and readability of their articles – even those that are not published by APS. The highly selective Outstanding Referee program annually recognizes about 150 of the roughly 60,000 currently active referees. At the start of the program, in 2008 and 2009, larger groups were selected by our Editors for the Outstanding Referee designation, in order to "catch up" and recognize referees who had already served for many years. Like Fellowship in the APS, this is a lifetime award. In this year, 2015, 142 Outstanding Referees were selected. Our Editors select the honorees based on the quality, number, and timeliness of their reports, without regard for membership in the APS, country of origin, or field of research. Referees are rewarded for their work carried out since 1978, the earliest year for which we have accurate data on referee reports returned. Individuals with current or very recent direct connections to the journals, such as editors and editorial board members, are excluded. The decisions are difficult and there are many excellent referees who are still to be recognized. The honorees come from over 50 different countries, with large contingents from the US, Germany, Canada, Spain, UK, and France. All listed in the table have been notified, offered the option of anonymity, and will receive a lapel pin and a certificate. Simple recognition ceremonies are held at some APS meetings. The Outstanding Referees are to be congratulated and thanked for their outstanding service to the physics community. Editors select the honorees based on the quality, number, and timeliness of their reports.